But I do have one favorite that I look forward to just at Christmas. This is something my dad used to fix for me when I was growing up & I do it now myself. .. & dont pass judgement until you try it! Seriously! Because you will read this & think, EWWW - but dont knock it until you try it! But you take one - get a big spoon - or a spatula - something that you can squash that baby with. It takes some strength to flatten it. See - you burn calories & build muscles while making this treat... BONUS! Then you put it in the microwave for a few seconds - not too long... Just enough to soften the Cream Drop - but not enough to melt it to where its all liquid - which can happen... & all is not ruined if that does occur. You just take a spoon - or a tongue - & lick it off the plate! But it really is the best treat. It makes the saltine cracker soft... & even if it doesnt soften the cracker, you have a good salty crunch with the sweet, soft, melted cream drop. Anyone else ever try this? Is it just a Southern Thing? Or just a weird family tradition? never had those dream drops.. sound yummy.. the cracker thing sounds okay. I cook mine in the oven with butter.. Sounds interesting. I love saltines and cream drops. Might just have to try it. Love Christmas traditions. I can't wait to bake cookies with my big sis! We used to always get 2 of those Old Fashioned Cream Drops in our bag of fruit and candy at church when I was little. I love them. It's been a long time since I've had one. Guess what I'll be looking for now. haha. 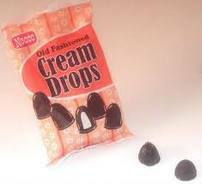 Oh I loved the cream drops. My Grandma used to make sure they were in our stocking. Yep one stocking divided for us kids. Funny huh? Anyway......... I have never heard of it with saltines. I may have to try it. I just don't know. 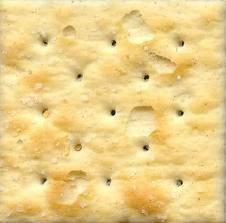 You had me until the cracker part. I have never actually seen or tried a cream drop and I love saltines. Plus, they always say having that nice mix of salty with sweet is always a nice mix. I would try it so now I just need to look for those cream drops! Whaaaa?! I've never heard of such an animal!! I've never even seen this candy before let alone heard of it til now. Sounds like a fun experiment to me. I've never had cream drops, but I won't judge about the crackers. :) I have a fabulous cookie recipe that includes Ritz crackers. I just saw the cream drops at Wal Mart last night :) 97 cents baby! Thanks I so love my pink hat too.. I have never heard of it...but it actually does sound kind of yummy!